It is one of the great mysteries in biology: how does a cell neatly distribute its replicated DNA between two daughter cells? For more than a century, we have known that DNA in the cell is comparable to a plate of spaghetti: a big jumble of intermingled strands. 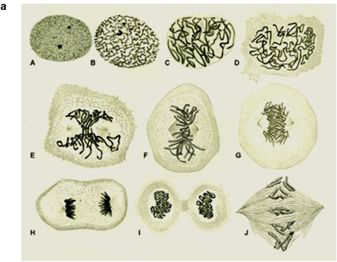 If a human cell wants to divide, it has to pack two metres of DNA into tidy little packages: chromosomes. This packing occurs using proteins called condensin, but how? When it comes to this question, scientists are split into two camps: the first argues that the protein works like a hook, randomly grasping somewhere in the jumble of DNA and tying it all together. 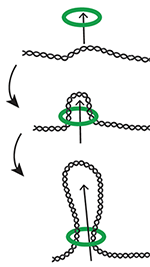 The other camp thinks that the ring-shaped protein pulls the DNA inwards to create a loop. With an article published this week in Science, researchers from TU Delft, EMBL Heidelberg and Columbia University give the ‘loop-extrustion camp’ a significant boost: they demonstrate that condensin does indeed have the putative ‘motor power’ on board. ‘There are different schools on this question within the field of cell biology’, explains nanobiologist and head of research Cees Dekker from TU Delft’s Kavli Institute. ‘In recent years, the hypothesis that condensin extrudes loops has been winning ground, supported by computer simulations. 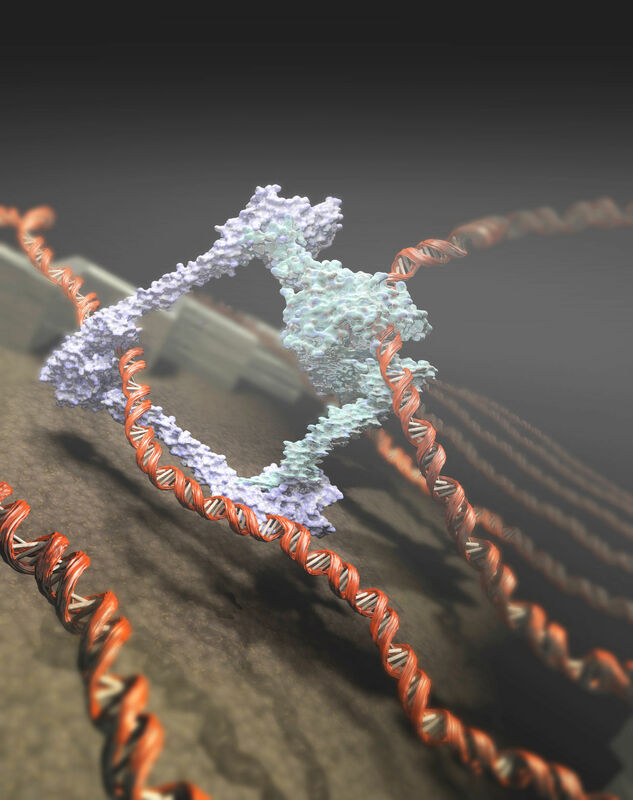 The idea is that that the ring-shaped condensin grabs the DNA and pulls it through its ring in a loop-like fashion. This is only possible if the protein has motor activity. One problem with this loop extrusion model was that, up until now, a motor function of this kind had not been detected. In addition, too much energy would be required to pull the loops through the ring, far more than the fuel usage that was observed for condensin’, adds Prof Cees Dekker. In their article in Science, the researchers show for the first time that condensin does indeed have a motor function. They positioned DNA molecules that were stretched on a surface and added condensin proteins, each fitted with a light-emitting quantum dot to enable observation. ‘We observed how condensin does indeed translocate along the DNA. This only happened if fuel was present, in this case the molecule ATP – the petrol that powers all processes in a cell’, explains Jorine Eeftens, graduate student at Delft and one of the first authors. ‘The results also show that condensin takes extremely large steps on the DNA, and therefore needs significantly less ATP than previously thought’. In the second stage of their research, the researchers replaced the light-emitting quantum dot on the condensin with a light-emitting string of DNA. They once again witnessed condensin moving in the same way. Condensin is therefore able to move a piece of DNA in relation to another, which corresponds with the idea of a loop being formed. The research represents a significant step in the fundamental understanding of our cells, but it is also relevant for medical research. Problems with the protein family to which condensin belongs, the SMC proteins, are related to hereditary conditions such as Cornelia de Lange Syndrome. Condensin is also crucial in the organisation of the chromosomes during cell division, and errors in the process can result in cancer. A better understanding of these processes is vital for tracking down the molecular origins of serious illnesses. The research was supported by the NWO Gravitation programme ‘Frontiers of Nanoscience’ (NanoFront). Read the Science article: ‘The condensin complex is a mechanochemical motor that translocates along DNA’ Science, 7 September 2017.